I just bought T8sg v2 plus model. USB mark on the controller LCD screen. (I did not anything about that) I tried to find may thing how to fix it. After i checked that i tried to update firmware with Dfuse USB upgrade tools 2.31. version. This is what i did it and happen. 1. press Exit button with Power button at the same time. 2. hand's off the Exit button but keep pressing power button. 3. 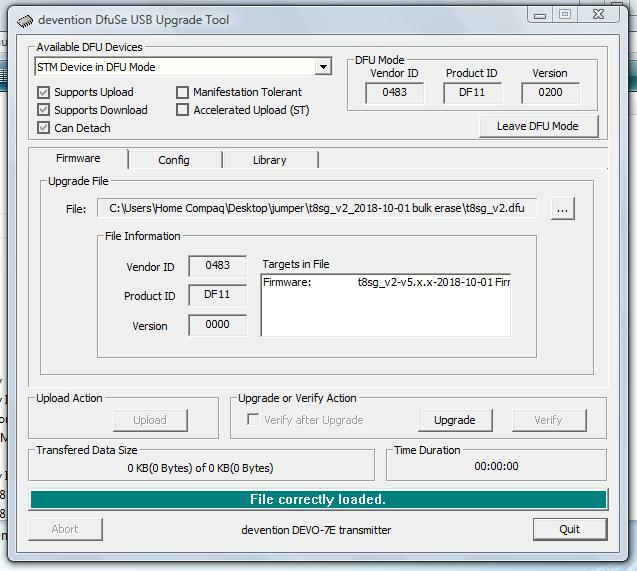 I have installed the lasteted version(deviation-t8sg-v5.0.0-d90cb3b) with Dfsue tool. 4. After upgraded, when i press the power button, there is any mark on the screen. 5. Just Red LED turn on. 6. I recognizedthat did wrong firmware updated that i did right firmware as "eviation-t8sg_v2_plus-v5.0.0-d90cb3b" version. 7. when i pressed power button, the USB mark keeping on the screen. PS : there is some comment to format USB drive in my computer, but i still cannot read USB driver, i can see the driver in computer but cannot format. I also tried many different computer but symtom is same. Last edit: 27 Aug 2018 09:50 by Moong. Format transmitter USB drive and write filesystem from firmware archive. 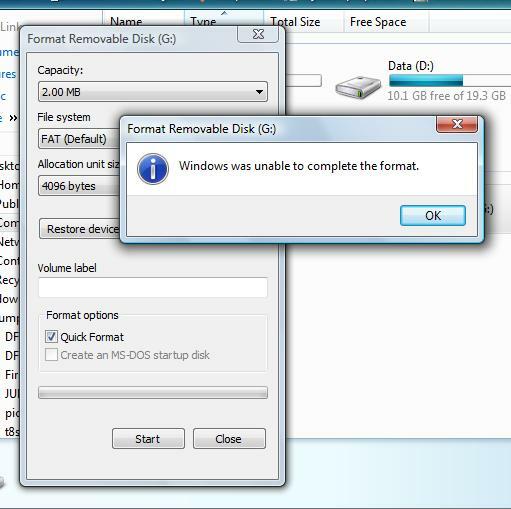 Even i cannot hardware USB format. It cannot read on my computer. Only i can see the drive but cannot read. Try format the drive on different computer. I could not format with different computer. i could see USB drive the computer, but it cannot read that. what can i do more? please comment. thank you. Try flash next build with bulk flash memory erase, then return to normal nightly build. With this build you can try format transmitter USB drive and copy filesystem from firmware archive. But don't use it permanently. Last edit: 27 Aug 2018 10:29 by vlad_vy. Sorry, I forget change files. Now it fixed. Last edit: 01 Oct 2018 06:47 by vlad_vy. Thank you for your reply. but i am still not sure what is the bulk flash memory erase. is this not normal delete? or need some special software? 1. I connect from t8sg v2 plus model to my computer. 3. there is USB mark on the transmitter LCD screen. 4. Some USB drive pop up in my comuter. 5. I cannot read this drive. but also it does not work with mouse right click button. 6. I cannot format and erase this drive. 7. I tried to updated lastest firmware on transmitter. but result is same. please reply my comment. thank you. With your attachment file. it is great working! when i updated with this file. it was automatically format USB drive! and i copied all firmware file to my drive it was work!! thank you so much! Don't forget flash normal nightly build. Do not use attached firmware for everyday use. Please, tell me what you do to have success. Thank you. I am having the same issue of the usb format. 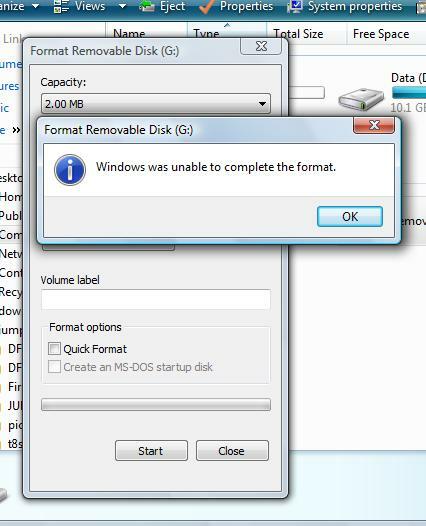 Windows unable to format at all. The file t8sg_v2_plus.zip can be used for t8sg V2 model also? Last edit: 01 Oct 2018 06:46 by vlad_vy. Thank you so much for your reply and the attachment vlad_vy. The bulk flash memory erase appears in the DFuse tool, or when i flash the firmware, it will do the bulk erase? Will try it later when I am home and report back here. You need flash firmware and boot once with it. You can try format USB drive and write filesystem with it, if you like. 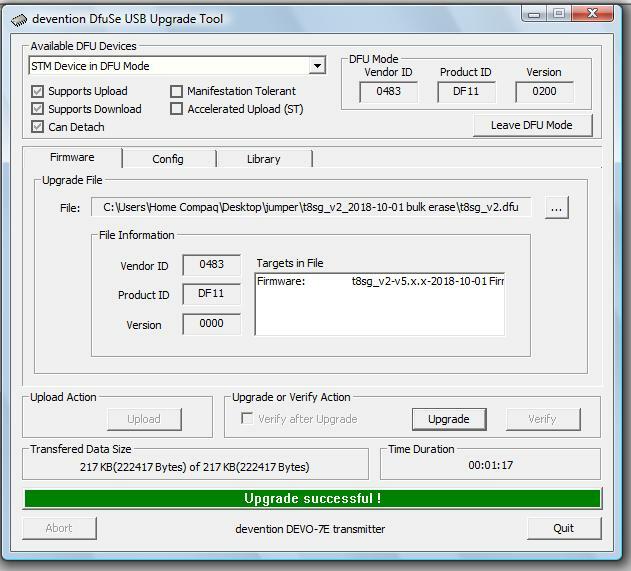 1) Upgrade firmware was successful in dfu mode. 2) After I exit dfu mode and remove device, I boot....usb logo still there. 3) Press ent and power, usb logo still there. 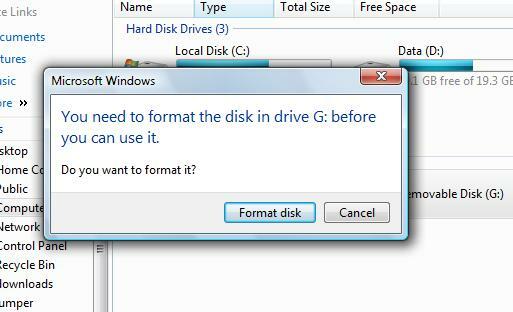 4) windows sees my drive but when format, the error persists. 5) Safely remove device, and power on, usb logo still there. My windows is vista, have also tried on Windows 10 but the error still remains, Windows still unable to complete format. The filesystem on the 2MB storage is indicated as RAW. See pictures attached. I am totally lost. Any other suggestions? From the images I see that you did not load the right file for a T8SG plus radio. Once the file is loaded you must turn off the radio then press power and return at the same time at that time it goes to usb and you must put all the files. Then turn off the radio by pressing briefly. Thanks for the reply. I was loading the bulk erase firmware. Prior to this, i loaded the latest nightly build but was still unable to format. I just tried again and still not successful. I loaded the firmware in dfu mode. Dfuse usb recognised my stm dfu. After successful upgrade, i off the tx and press return and power. Usb logo appeared but windows saw my drive. But when i formatted, the error resurfaced. I hope I didn’t miss any step. Its return and then power for usb mode and ext and power for dfu mode right? The latter will is points you to a driver isssue on your PC. But if it is marked as raw, only a special tool will help to get around this. In my case with my 7e I used fdisk from the linux tool box. I have a Mac, anything that I can use? The disk utility saw the drive as RAW as well.